1: Whats in a URL? How the Internet works and how to build a website. What are some words/slang for the internet and for using the Internet? Web browsers let you go onto the internet. Safari, Google Chrome, Internet Explorer and Firefox are all web browsers. Web pages are files stored on computers, that are connected to the internet. Web pages are the pages full of words, pictures, videos, interactions and links to other webpages. HTML formats (arranges the layout of) webpages. A program called a text editor, or code editor, allows you to write your code or mark up and save the file as a .html file. A browser can open html files. Some common text editors are Notepad++ for PC, TextEdit for Mac and Adobe Dreamweaver. There are many tools for easily creating websites without knowing HTML and CSS, so why should we learn to code? Website builders are great if you are building a site that is similar to many other existing sites. But if you want to build something new and of high value, you need to know how to code. A URL (universal resource locator) is an address that identifies the location of a web page, image or other file on the Internet. E.g. http://www.google.com is the URL for the Google search engine. Note: The DNS is the domain name system, or the name of the website. So what happens in the diagram? Be prepared to learn some acronyms! The videos above cover similar content, so watch them as well. Tech target → has an article, posted by Margaret Rouse, that explains HTTP in more depth. Once the ISP recognises that you want files sent using the hypertext protocol it accesses a DNS, the domain name system. There are two addresses for a server computer. So you need this number to access the files you want (the website) but you can't be expected to know 2001:db8:0:1324:0:567:8:1 (IPv6), so you type in a domain name, your internet service provider asks a DNS where that actually is, the DNS sends back an IP address. Then the ISP goes "Awesome, 2001:db8:0:1324:0:567:8:1 send me your file on racecars, it is in your car folder in your content folder" then the server sends the ISP the file, your ISP sends the information to you (the client) with the URL saying "Wikipedia sent this information". There is a lot happening and it happens really fast! Oh, also the servers you are accessing probably far are across the ocean. Isn't technology so amazing? Try the internet quiz to cement your learning. You can see the results of the lessons and quizzes for your whole class with the [/admin|admin]] page accessible by the [[/profile#teachers|student dashboard. Here is some information on how to make your own website. A domain name is a URL people can type into their browser to get to your website. Choose a t.l.d ending. Tld identifies the most general part of the domain name in an Internet address and follows the last dot in a URL. Domain name is taken by someone else. If you have a lot of money you may be able to contact them and make an offer. Domain name is for sale. Someone purchased the domain but now wants to sell it to you. The price can vary up to 100k plus. Domain name is available for purchase at the standard price of < $12. Navigation : The navigation affects the hierarchy and architecture of the information on your site. Content : Plan and gather information and media which will make up the content with which you will build. HTML: HTML to build your web page. 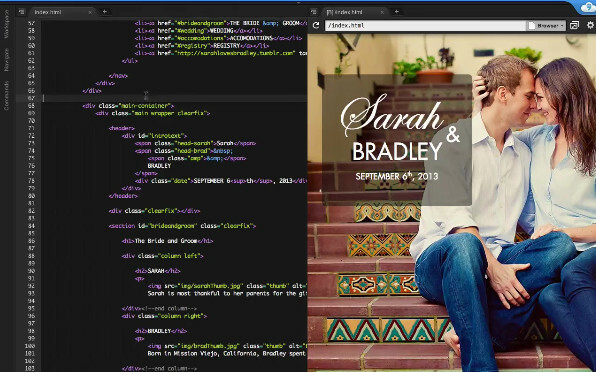 While there are programs you can use to create a web page that don't require knowledge of HTML, you will do better and have more flexibility if you actually know HTML. CSS: Use cascading style sheets to style your website and change the look to the way you want. A web host is a business who provides storage space for a website and all its web pages. You want to get it online so others can view it, so the first thing you will want to do is find a hosting provider. Web hosting can cost from nothing to millions of dollars depending on how much your site is used. 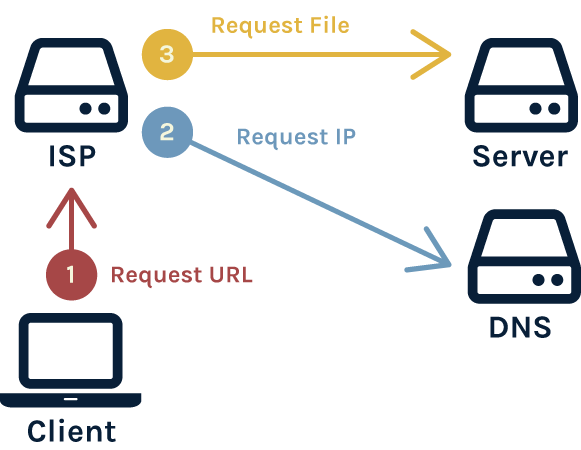 Get the pages you have designed up to the hosting provider you have chosen, through either the tools their service provides or with FTP (File Transfer Protocol) clients. The basics: title tag, meta description, internal links, header tags, etc. Including lots of high quality content. Blog posts, industry articles, tutorials and how to guides, infographics, videos, podcasts etc. Link building - get other sites to link to yours. Tools like Google Analytics → are used to monitor the statistics of a website traffic and traffic sources. To keep your site going well and looking good, you need to continue testing and maintaining it even after it has been live for a while, because with new devices coming on the market and upgrades to browsers, your website may be affected. You should also continue working on content development of your site because the more content you provide the more visitors you will get. A web browser is what you use to connect to the Internet. A good website will work across all browsers but you will have a preferred one to use while you are making, testing and updating your website. Choose a modern web browser that has good development tools to help make building web pages easier. A text, or code editor is a program that you can open up web files in and edit the content and formatting of the webpage by adding code. Your view will be of a bunch of text on a page that is then transformed into a webpage. There are hundreds of good text editors out there. 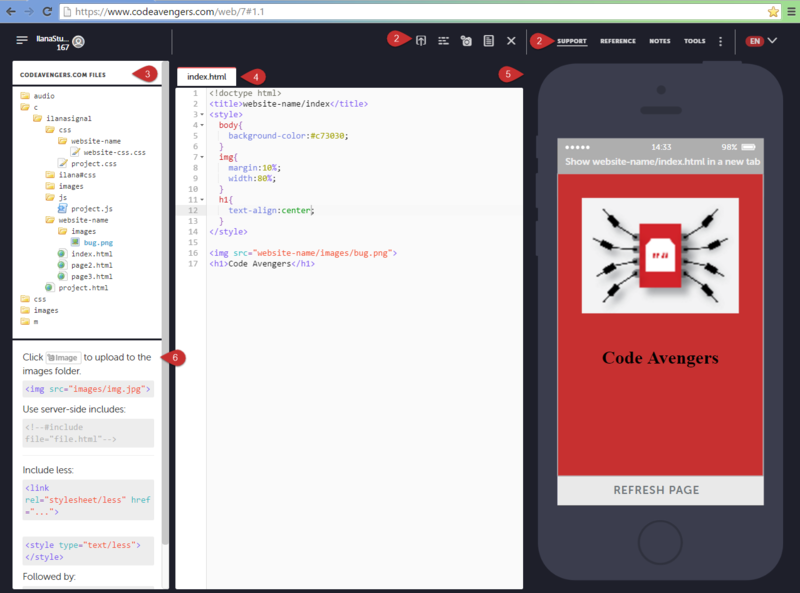 For this course we'll be using codeavengers.com. It is an online text editor that allows you to see results as you type HTML and CSS. Below is an image of our I.D.E where you can make your own projects. If making your own website is too much work you can use sites, like these below, to build yourself a website. 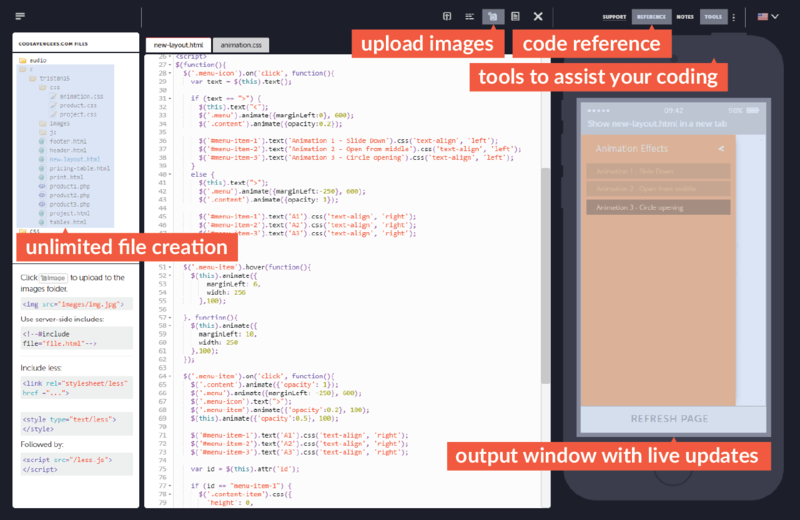 Cloud 9 combines an online code editor with a full Ubuntu workspace in the cloud. It provides a live preview which enables you to interactively see what your web application looks like! With focused visual tools and pre-processor support, Brackets is a modern text editor that makes it easy to design in the browser. Use contextual code hinting to easily define fonts, colors, and gradients in your CSS, and drag and drop web-optimized images into your designs. CSS 1: first official spec published in 1996; included support for specifying things like color, fonts, alignment, borders, margin and padding. HTML 4.0: published in December 1997; deprecated many HTML tags and attributes (such as font and center) that were used to style web pages, in favor of CSS. CSS 2: published in 1998; added support for new capabilities like fixed, absolute and relative positioning, z-index, media types and new font properties such as shadow. XHTML: is a more restrictive form of HTML that conforms to the XML standard and was first published in 2000. Development the HTML5 spec began in 2004 and was published as a working draft in January 2008. A final call for revisions to the standard was announced in May 2011. The W3C is aiming to publish complete spec in 2014. 1.10: What's New in CSS3? The latest versions of all the popular browsers offer good support for most features of HTML5 and CSS3. See http://en.wikipedia.org/wiki/HTML and http://en.wikipedia.org/wiki/CSS for more details.